Since the little man was born, I haven’t had the chance to go out and buy many clothes for him. We were given so much stuff when he was born, and the grandparents / aunties have gone overboard at times, so we’ve not needed much. Count yourself lucky I hear you say? Well yes, I should, but part of me has been craving a shopping trip to go and pick the clothes that I want to dress my little man in!! But, i’m also quite conscious that I don’t want to go over the top and end up with lots of stuff when it’ll only fit for a few months. I love fashion, and while I am (trying) to drop the baby weight, i’ve put myself on a bit of a shopping ban! So, the next best thing is shopping for the little man. I have found that baby girls clothes are way cuter than the things for baby boys, and that most boys stuff is dinosaurs, robots, diggers or foxes! Where I don’t mind a few bits like that, I’m more of a fan of colours and prints. Before he was born we fell in love with a Liberty blanket from Mamas & Papas which was blue with a floral border, which we bought. And yes, we use it for him all the time – what’s a few flowers?! 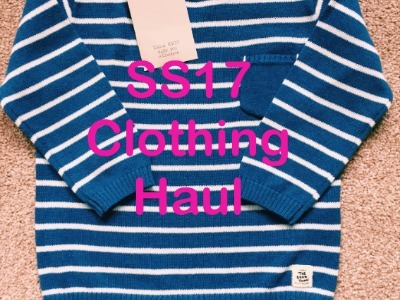 We’re now in need of a 9-12 month wardrobe, and it’s Spring / Summer – which is normally my FAVOURITE season, as I love layering! So, off I went with my trusty new credit card (my best friend now that maternity pay has come to an end!!!) to get a “few essentials”. Zara was the first place I visited, and was super excited as had seen some lovely little bits on their website and from some vlog posts I had watched. The store I went into had loads of things for hot summer days, but in reality I knew that the next few months wouldn’t be sun, sun sun (unfortunately). 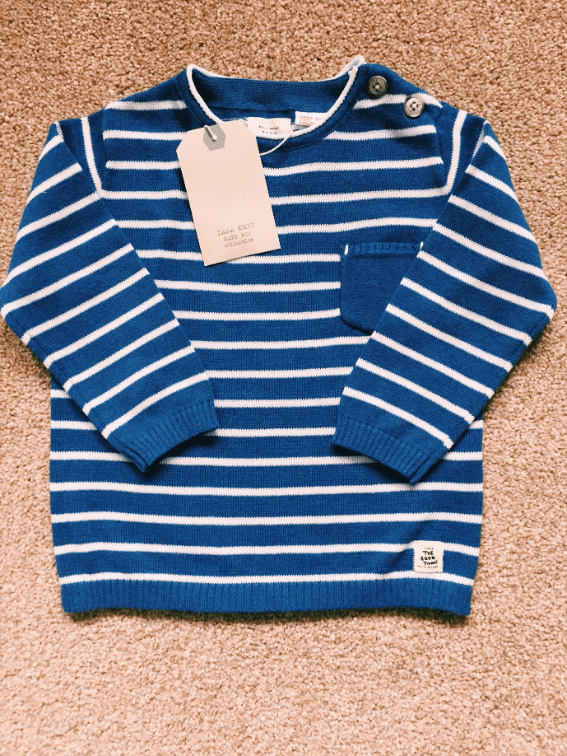 I fell in love with this gorgeous blue striped sweater which was £12.99. The material is just so soft and it’ll be great for those days when it is a little chilly and long sleeves are required! For days when we are just chilling at home, I love nothing more than putting little Z in a sleepsuit as I find them soooooo cute! I also know that his days of wearing these are limited so I have to make the most of it while it lasts! 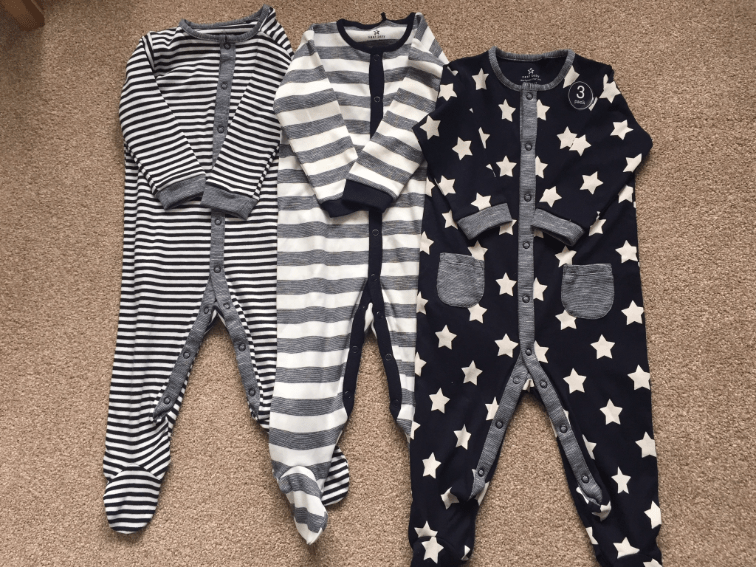 These navy stars and stripes sleepsuits are fab – cute and great for day wear, and they were only £16 for a pack of 3. Left: 2 Piece Pure Cotton Bodysuit & Bib Shorts Outfit – £16. This will be absolutely perfect for summer days, and is extremely cute! 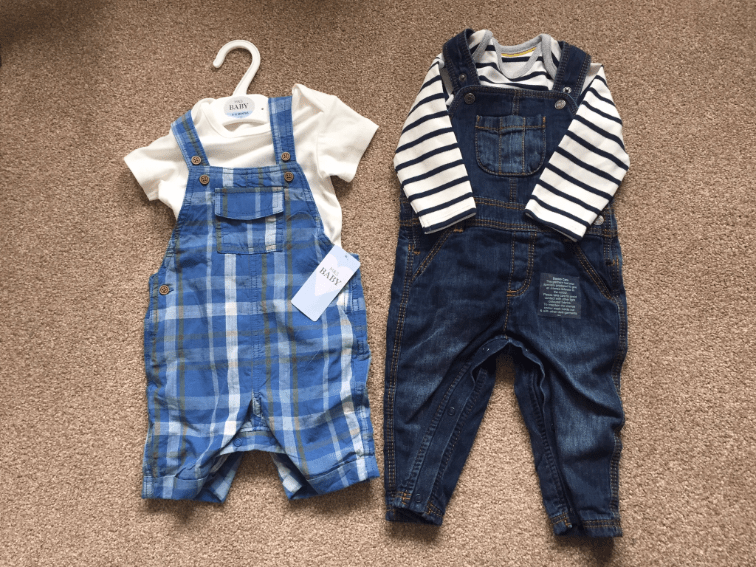 Right: 2 Piece Pure Cotton Dungarees & Bodysuit Outfit – £16. I am a massive fan of denim (and breton) so I loved this combo. 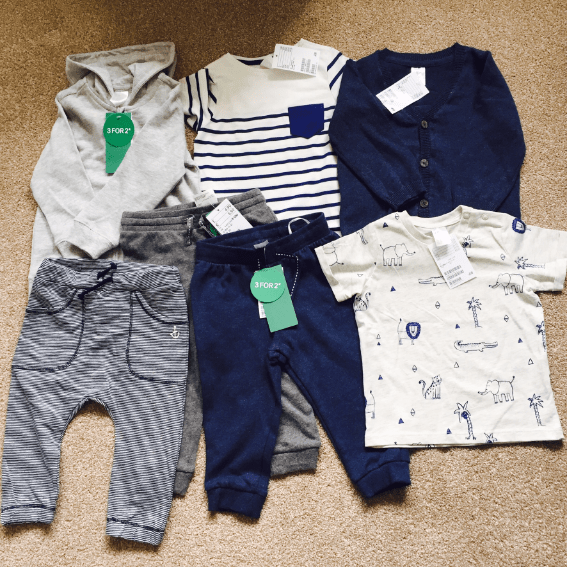 I had never shopped at H&M for baby clothes before, and oh my god, I have totally been missing out! They have some great key pieces which are cute and trendy, as well as being VERY reasonably priced! I wish I had gone there first as they had so many great pieces at such good prices, and great for layering through our very bipolar summer weather! 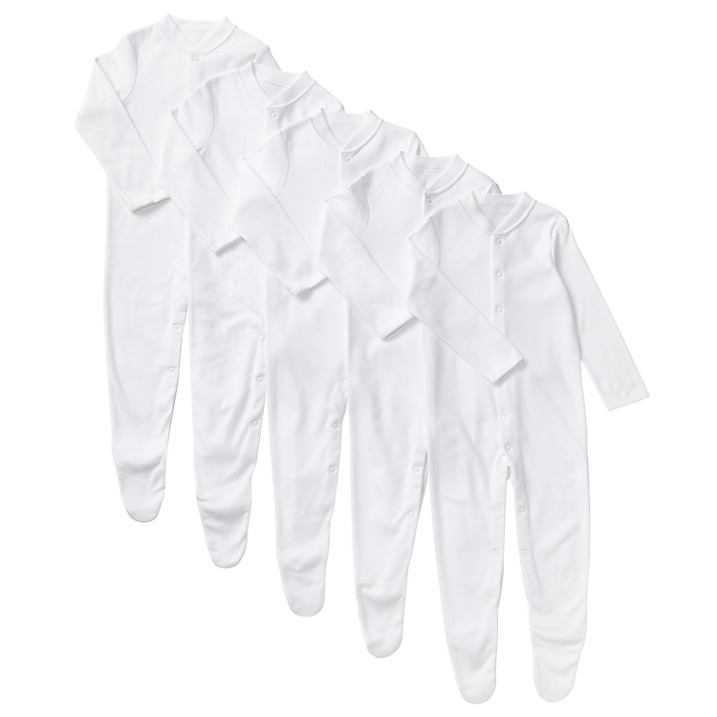 For nighttime, there is only one option for me – John Lewis long sleeve organic cotton sleepsuits (£15 for a pack of 5). They are super soft and wash brilliantly! So, there we go, that’s what we’ll be mainly wearing for SS17…… time to get them all washed and put away! ← When did I become invisible? You’ve got some lovely pieces! I love all these shops baby clothes too! I’m always the other way round admiring the girls stuff!